Patrick and Catherine(Durrix) Sunderland resided in County Wexford, Ireland(click HERE for a map). They had 6 children, all born prior to 1843. They were: John, Margaret, Ann, Miles, Thomas, and James(born August, 1836). Patrick passed away in 1843. In 1857, brothers James(20) and Miles(24) made their way to Liverpool, where they boarded the "De Witt Clinton" for New York, arriving on Friday, April 3rd, 1857, after 9 weeks at sea. Their siblings stayed behind to assist their widowed mother in the day-to-day operation of the family farm. Click HERE for a wonderful bio of Miles, written in 1887. James took a job as a clerk, and resided in Brooklyn, NY. On September 9, 1858, he enlisted in the army for a period of five years. In June of 1860, James was an army private stationed at a garrison in Clark County, Washington State, near Vancouver. This must have been an interesting post, as there wasn't much in Washington at the time other than fur traders, loggers, and Indians. In September of the same year, he was one of a group of army privates in the Colville Valley, in the Spokane Territory, acting as escorts to a military road expedition under the command of General John William. I can only surmise that they were determining where roads could be built, as they had a couple of civil engineers along for the ride. In 1863, James was a private in the 3rd U.S. artillery out of Massachusetts, stationed on a steamer patrolling the Mississippi at Memphis, Tenn. On August 6 of that year, he re-enlisted. Later that year, the 3rd was reassigned to the fort at Boston Harbor. In March of 1864, they were reassigned again, this time to the forts of Washington, D.C., to protect the capitol. Not long after, James was either wounded, or fell ill, and was sent to the Fairfax Seminary, a Union hospital in Alexandria, VA. He received a disability discharge on September 24, 1864. In 1870, James was 33, and had been married for two years to a nice girl from Ohio named Mary Ellen Hartman, who was 23(born August, 1846). Her parents hailed from Ireland. James and Mary had a 1-year-old son, Thomas, born in November, 1868. They owned a farm in Kerr Township, in the county of Champaign, state of Illinois. Albert Emrey, a 12-year-old from Ohio, is also staying with them at the time, but his relationship to the family is unknown. The farm is valued at $14,000. The census of 1900 shows the family has grown. James is now 63, his wife Mary is 53. They have eight children, five still living with them on the farm: James Jr.(25), Anna(21), Mary(19), John(16), and Charles(10). Catherine & Margaret have married, and Thomas has his own farm. James is still paying off the mortgage on the farm. The census of 1910 shows James & Mary 10 years older, now 73 & 63. Two of their children still live with them, Mary(28) and Charles(20). A hired hand named Benjamin Saterfield, 28 years-old and from Ohio, also lives on the farm. James passed away in February of 1912. 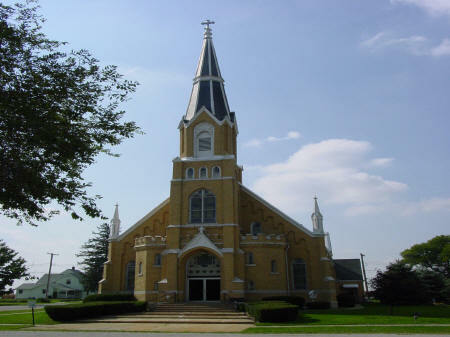 His funeral was on February 13, at St. Lawrence Church in Penfield, IL. Father J.F. Purcell officiated. The church, pictured below, was built in 1905. He was buried in the Catholic Cemetery at Penfield. Click HERE for information about James' family after his death. 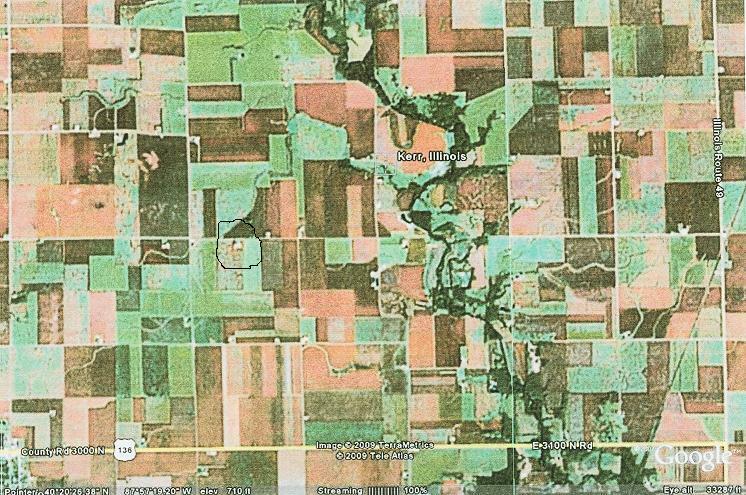 Below is a satellite image of the farm in Kerr Township as it looks today. I've circled the farm house, just left of the center of the picture. Comparing this image to a plat map from 1897, it appears that the area has changed very little in the last century. It's entirely possible that Sunderlands are still living there today! In 1891, Thomas Sunderland(22) married Catherine Van Buren(19). By 1900, Thomas & Catherine live in Hoopeston, IL and have two children, Vera(7), and Harry(3). By 1910, the family had grown to include Ralph(8) and Margene(2). At this time, Thomas was a factory laborer. By 1920, Thomas & Catherine had seperated. Catherine(47), Vera(27), Ralph(19), & Margene(12) were living in Los Angeles, at 5267 McKinley Avenue. Vera was teaching, Ralph was a baker at a grocery store. In the early 20s, probably 1921, Vera married Harry Delaney, the man who'd rented a room from her grandmother Mary, in Helena, Montana. By 1930, Harry and Vera were living on 2009 Carlin Avenue in Compton, CA. They had three sons, Lou(5), Jack(8 months), and Jay(8 months). Also in 1930, Thomas Sunderland, now 60 years-old, was working as a watchman at a "poultry killing plant" in Fontana, CA. 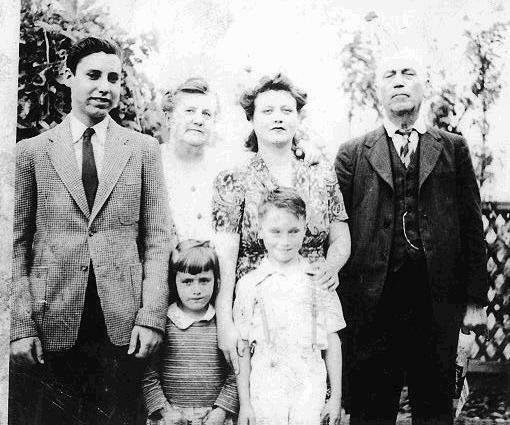 Thomas(far right) and Catherine(2nd from left) are pictured below, along with their daughter Margene and her children Gary and Ann. Also pictured is Lou Delaney. Thomas' oratory skills gained him the moniker "The Irish Cyclone". Mary Ellen(Hartman) Sunderland, James' widow. After her husband's death in 1912, she remained on the family farm, located at RFD #27, Penfield, IL. Thomas Sunderland(b.11/1868), James' son. Thomas married Catherine Van Buren in 1891. By 1910, they were living in Hoopston, IL, and had four children: Vera(b.1893), Harry(b.1897), Ralph(b.1902), & Margene(b.1908). Their address was 509 W. Washington Street, Hoopston. By 1920, Thomas & Catherine had separated. Catherine, Vera, Ralph, & Margene had moved to Los Angeles, and lived at 5267 McKinley Avenue. Margaret Wood(b.1872), James' daughter. Margaret married Charles M. Wood. In 1912 they lived at 1428 N. Walnut St., Danville, IL. By 1918, they had moved to 307 N. Elm in Urbana. They had a son named Asher Giles Wood(b.12/31/1891). Asher would marry Helen Riley Anderson on 6/23/1928 in Danville. Asher died in Danville on 12/28/63, and is buried in Springhill Cemetery in Vermilion County, IL. Catherine Herbert, James' daughter. Catherine lived in Harwood Township in Champaign. Her husband was a farmer named George Herbert(b.1863 in IL.). They had 5 children: James(b.1895), Frances(b. 1900), George(b. 1906), John A. (b.1910), Catherine V.(b.1913). James Edward Sunderland(b.2/4/1875), James' son. James lived at S. Neil St., Champaign, IL in 1912. By 1920, he was a "roomer" with his brother Charles at N. Neil Street in Champaign, a hotel run by an Irish woman named Mary Roe. James & Charles were both real estate salesman. Anna C. Zorger(b.4/3/1879), James' daughter. Anna married a physician, Charles Zorger(b.1867). In 1912, they lived at 301 W. Monroe St., Bloomington, IL. They had a daughter, Mary M., born in 1907. Anna Zorger died in February of 1973. At the time of her death, she was living at 61080 S. Beloit, Winnebago, IL. Mary Ellen Sunderland, James' daughter. Mary Ellen lived with her mother at RFD #27, Penfield, IL. In 1920, Mary lived with her brother John and his family in Kerr Township, Champaign, IL, probably on RFD #29. John Stephens Sunderland(b.12/26/1884), James's son. In 1912, John lived at RFD #23, Rantoul, IL. By 1920, John had married Ruth(b.1888). They had two children: Zeta(b.1908), and John(b.1917). By 1930, the family had moved to Los Angeles. In that year, Zeta was 21, John was 12, and there were two new children: Ruthie(b.1923), and Charles C.(b.1925). John Sr. worked as a chauffeur for a private family. Ruth worked as a "janitress" at an office building. John Sr. died on 9/10/1965. Charles M. Sunderland(b.1890), James' son. Charles was living with his mother at RFD #27, Penfield, IL, when his father died in 1912. In 1920, he and his brother James lived as "roomers" at N. Neil Street in Champaign. They were both real estate salesman. In 1930, Charles worked as a mechanic for a manufacturing firm. He'd married Josephine(b.1892), and they had a son, Wilbur(b.1916). They lived at 304 E. McClure Ave., in Peoria, IL.